It's been five months since we brought Mako home, and it's been a whirlwind to say the least! We love her so much and she has fit in with Tarpon and Scooter marvelously (except for a few mishaps we don't have to get into haha). But it hasn't all been a breeze- she is still a puppy after all! Cab and I are by no means experts in the puppy training department (to say the least), but we've seemed to have done pretty well with Mako thus far! So in honor of National Pet Month, I thought it would be helpful to share with y'all some of our puppy training tips! We 100% recommend that you crate train your puppy! Yes it is very hard to resist letting the puppy sleep in your bed and having to hear him/her whining through the night, but trust me, it will be worth it! You want to make the crate a place where your puppy enjoys being! Mako cried for about two weeks, but she now LOVES her crate, and will go into it at her own will. We no longer lock her in her kennel at night, but she continues to sleep in it! Tip: Leave a few toys in the crate with your puppy. Some nights filling a kong with peanut butter will keep the puppy occupied for awhile (which will prevent it from barking). Puppies have a lot of energy.. and I mean A LOT! Yes, they sleep a ton in the early stages, but when they aren't sleeping they are at 100%. Make sure you are either running around or walking the pup at least once a day! It really helped us that we have two other dogs to keep her occupied.. Mako runs around with tarpon all day long, so when she comes inside she is usually exhausted! Tip: Get the puppy used to walking on a leash early! I would put a leash on them as soon as possible, even if it's just around the house! Make sure your pup has enough toys to keep him/her occupied. I think this was a huge contributor of Mako not really chewing up everything around the house. Your puppy will eventually start teething, so I recommend buying more bones/durable toys. If they don't have hard toys to chew on, they'll start chewing on other things (Ie. furniture). Make sure you also buy at least one ball to throw around with your puppy. This is an easy way to quickly exercise your pup if you don't have time to take it on a walk! Tip: Don't buy expensive toys! They are going to be torn to shreds within minutes. Head to the clearance bins at your local retailer and load up on the cheap ones! Your puppy's nutrition, especially during the early months of life, is extremely important! You need to make sure you're not only feeding them enough food, but feeding them the right kind of food! 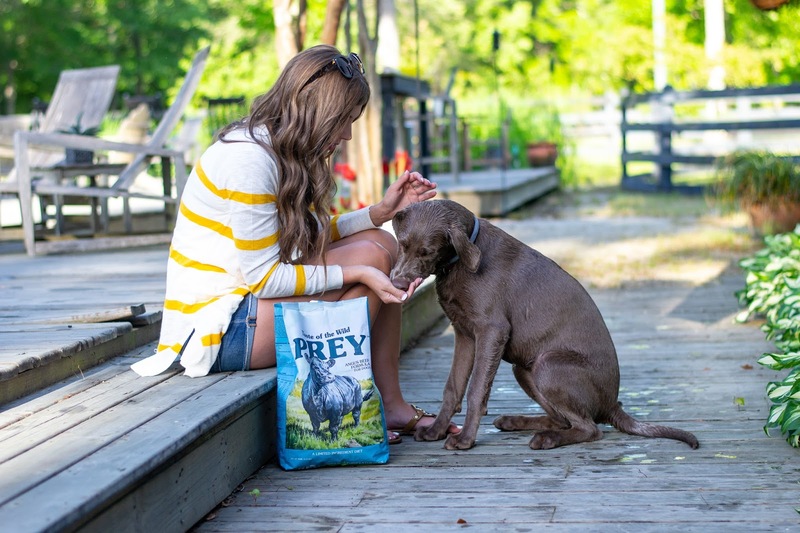 We started to feed our pups Taste of the Wild PREY and they love it! 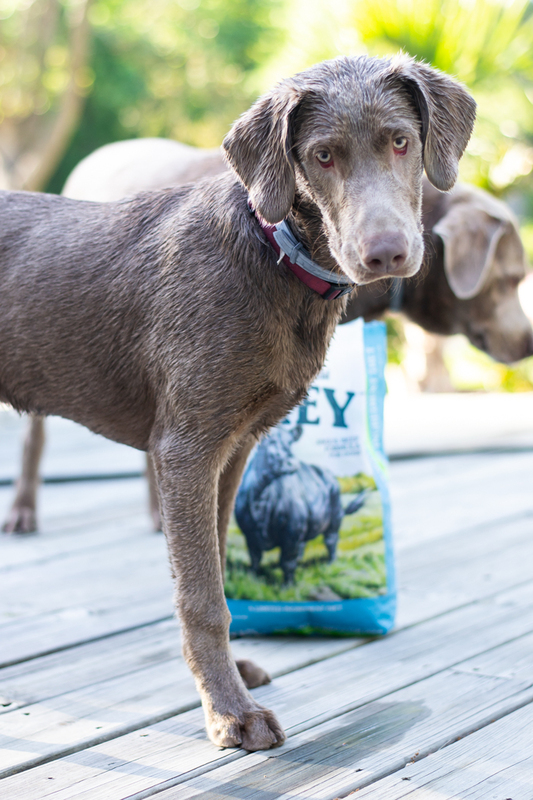 It's a Limited ingredient dog food only containing four or fewer minimally processed key ingredients, including real cage-free turkey, spring-fed trout or pasture-raised Angus beef, plus lentils, tomato pomace and sunflower oil. 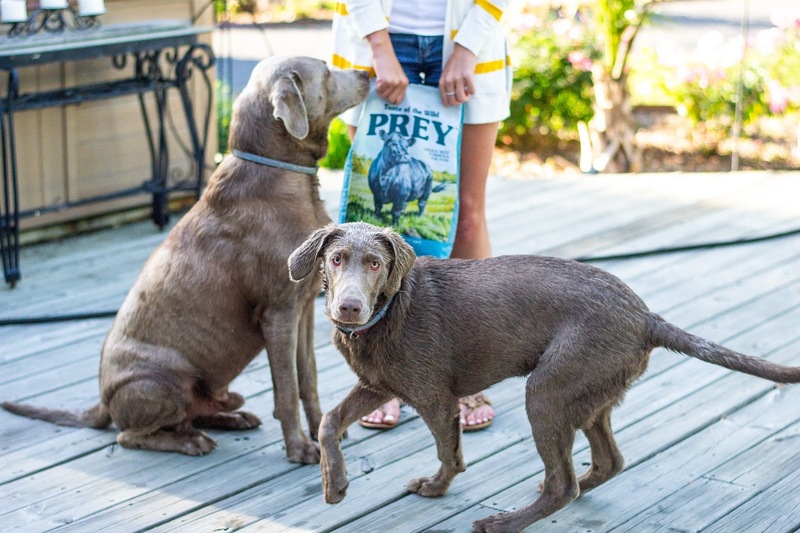 The dogs love it because it tastes amazing (I can only assume because that scarf it down so quickly), and we love it because we get to feed out pups simple and clean food with easy-to-recognize ingredients! 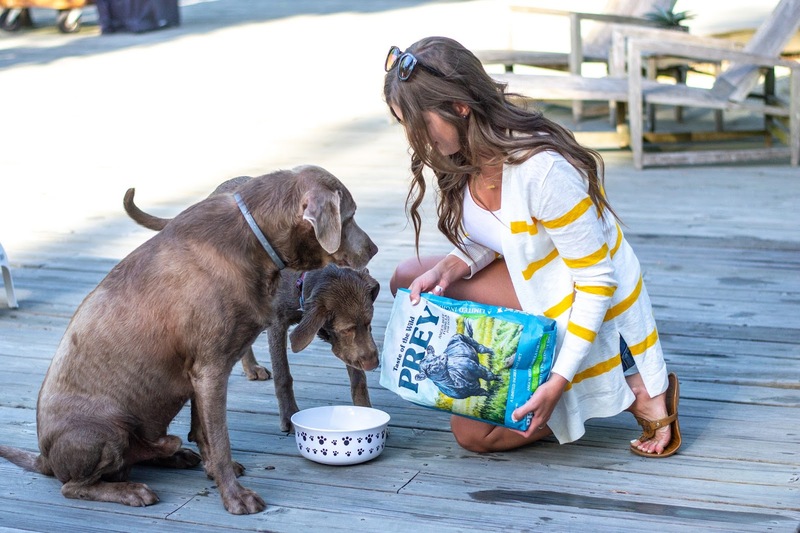 Tip: You can request samples from your local retailer for your pup to try! To find your local retailer, click here ! Or if I've already convinced you, click here to Buy Taste of the Wild PREY. The sooner you start to potty train your pup, the better it's going to be for you! The first couple weeks that we had Mako we were outside A LOT! Every 30 minute or so (and especially every time she woke up from a nap) I would take her outside to use the bathroom. Puppies at that age have very small bladders, so the more often you take them outside, the better chance you have for them not using the bathroom inside. Tip: Get a dog door if possible. Mako learned to use the dog door within a couple of days (having Tarpon for her to follow definitely helped) and it has been a lifesaver! Mako is getting so big we sometimes joke that we want to exchange her for another puppy. She is a huge ball of energy and her and Tarpon have become inseparable! We just love her so much and want her to grow up to be big and healthy! 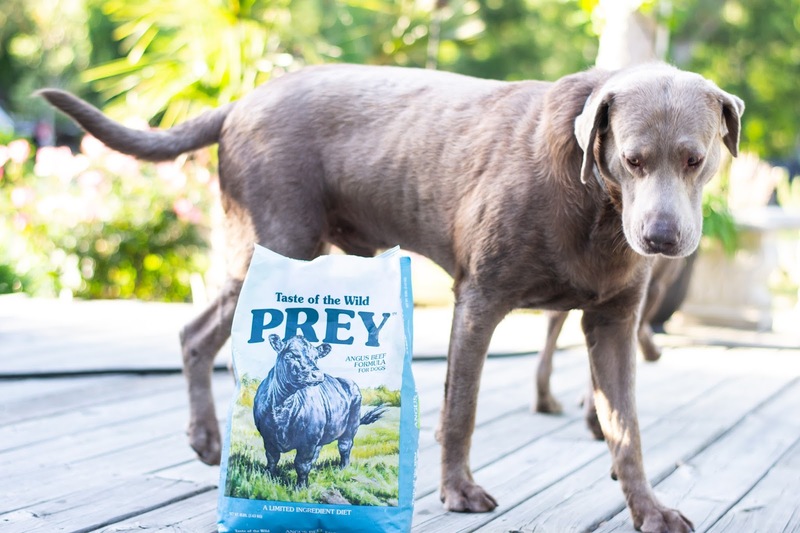 Thank you Taste of the Wild PREY for sponsoring this post. Follow them on Facebook. O I wish I had a dog! Great tips! I am loving all these tips! Definitely saving this post ! I don't have any pets but I do have friends that never trained their dogs... and it shows!! I think early training is so important when getting a new puppy! These are all such great tips! I have been wanting to get a dog for a while. Just have to wait until Nathan is a little older. These are all wonderful tips! Your pup is adorable. Not a pet owner. great tips though. I love these pups! Cuties! Yes, I did most of this when I got my puppy 7 years ago. She is wonderfully trained. My niece just got a dog and she's in the middle of puppy training -- still working on it. Love these tips! I've never trained a dog because it's always been my mom and she's like a master trainer! I'm hoping to get a dog in the next few years so this might come in handy! Thanks for sharing! Loved this post, training takes a lot of time but it's so worth it! I have three dogs and remember these days well! Getting your puppy trained as soon as possible is so important! 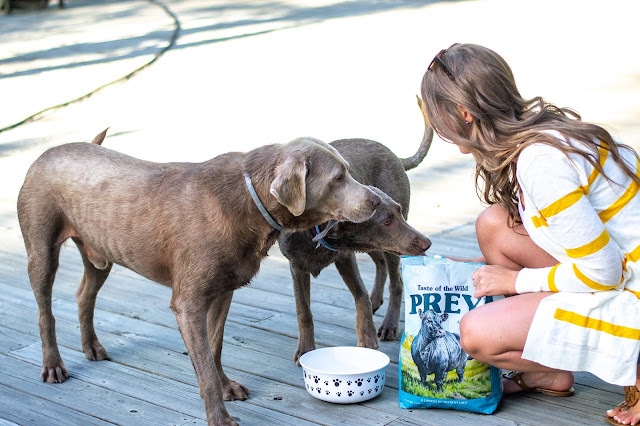 We love limited ingredient dog foods! 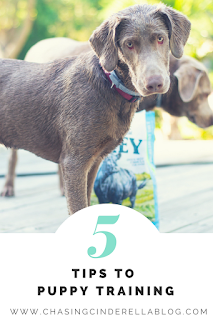 Our pup has very sensitive skin so grain free is the way to go! I agree!! Crate training and food play such a big part in starting your pup off on the right foot! Many cat carrier owners are worried they wouldn't be able to afford health care services for their pets. Pet insurance is a smart option to help you with the veterinary expenses. But before you finally decide, here are a few tips to assist you in your pet insurance choices.